Discussion in 'Other Skills' started by OrienM, Apr 2, 2017. Here's a little tutorial on making a loop-netted bag. Loop-netting, AKA looping, knotless netting, needle hitching, or nalbinding, is an ancient form of weaving, somewhat of a precursor to knitting. It uses a single piece of cordage in a spiraling chain of interlinked loops to produce containers, hats, socks, and other tubular items. It's fairly easy to do, and only really requires a couple simple tools, patience, and the ability to make cordage. Before you get started, get a good supply of raw fiber together. The material used in this project is raffia, a natural fiber taken from a palm tree and sold commercially for craft use. I've never worked with this stuff before...it's pretty nice, softer and less wiry than yucca, and lighter in weight. Check out those long, 3-4' fibers! Tools required are very minimal: scissors or nail clippers to trim loose fiber ends, and a large needle with an eye that suits your cordage. Begin by twisting up about 4-6' of cordage, 1/8" or so in diameter. Leave the working ends loose and tapered, so you can easily splice in more length later. The looped weave begins with a foundation knot, a simple slip knot. Note the slip knot is 'reversed'; pulling on the short end tightens the loop. The end of the cord has a single-overhand stopper to prevent it pulling out. Tighten the knot up as shown. Then thread the needle, using the other, loose end of your cordage. Showing the very first loop, the basic unit of this style of weaving. Each loop is simply a half-hitch, made going from left to right (viewed from inside the bag), and hitched to the loop directly below itself in the previous row. The size of these loops is up to you; larger loops result in a looser, stretchier weave. In this project I'm making fairly small loops, just large enough for the needle to pass through. Redwalker, Skruffy, ArmyMacE and 31 others like this. Once five loops are formed around the foundation knot, draw the slip knot as tight as possible, and tie another stopper knot up close to keep it tight. This 5-loop 'button' will form the start of your bag. Now, "step up", beginning the spiral weave by by hitching the next loop to the first of the five you've just made. Add a second loop into the SAME foundation loop; then, proceed around the other four foundation loops, adding TWO new loops to each. This "bumping up" doubles the number of loops each time you go around, increasing the final diameter of the finished bag. In this case, I "bumped up" for two full rotations, so ended up with a base of 20 loops (5-10-20). This will make a bag about 4" across. Another time around would produce 40 loops, and a bag diameter more like 8". The first complete "bumped up" row (10 loops), shown from the back. Note that the weave appears to go to be going from R to L! As weaving continues and the cordage gets shorter, it becomes necessary to pull the loose ends through by hand; this is your cue to pause and twist up more cord. Splice into the free ends to extend the cordage another 6' or so. After cleaning up the new length, you can put the needle back on and continue looping. Switch back and forth between adding loops and making new cordage as needed. Redwalker, Skruffy, ArmyMacE and 30 others like this. Here's the base with a new length of cordage after two "bumped up" rounds, 20 loops in circumference. At this point the weave switches from 2:1 to a 1:1 ratio, where each underlying loop gets only one new one hitched to it. After going around the base a couple times, the weaving is now beginning to cup a bit, as it transitions to what will be the tubular sides of the bag. Thanks for watching so far! Redwalker, piney, Skruffy and 38 others like this. OK! After some delay, I've gotten a bit more done on the bag. I forgot how slow these go once full diameter is reached...takes a lot of loops to build up the sides! Here's the bag-to-be now, after six rows of 1:1 loops...shaped kind of like a little bowl. It's sitting on a larger looped bag/backpack, which is made of yucca and dogbane, and is 40 loops in circumference. Changing colors, as shown in the large bag's stripes, is easy; just cut your working strands in short (2-3") tapers where you want the change to occur, and immediately begin splicing in fibers of the new color, using either natural or dyed material. Switching back is done the same way. Another nice decorative technique is to use rows of different types of loops. I've decided to experiment on the little bag by adding a few rows of double-twisted loops. These are very similar to the half-hitch loops we've been using, except that the cord passes through the loop twice each time. ...then adding the second turn to lock the loop in place. Four double-twisted loops...these will be continued all the way around the row. Redwalker, piney, Skruffy and 27 others like this. Also, please take note that this tutorial is now also a giveaway! Open to all BCUSA members, just post "I'm in" for a chance to receive the finished bag. ArmyMacE, schapm, captbrian and 7 others like this. i'm in, i guess-it'd be great to see the final piece in person! i'm definitely going to have to try this new skill.....AFTER i get some other items off my personal "to do" list. i even have a hand carved wooden needle from a friend that would be perfect! happywanderer, Falcon45, Winterhorse and 3 others like this. Falcon45, CivilizationDropout and OrienM like this. Great tutorial @OrienM ! I checked in on it last night and just came back to find that that there were more parts added. I'm looking forward to the next segments when you get the time. Oh yeah... and I'm in! ArmyMacE, chris67, Bitterroot Native and 2 others like this. Very impressive skills my friend. I'm in. Love hand crafted items. Falcon45, Winterhorse, CivilizationDropout and 1 other person like this. Did you wet the raffia first? I have some from other craft projects and I know you can separate it pretty finely, but are your strands two "regular strands" reverse twisted to get he 1/8"? CivilizationDropout and OrienM like this. Yeah, I have been wetting it a bit, just a spritz from a spray bottle now and then while working. To get 1/8" thickness is taking maybe 3-4 strands of raffia per side; occasionally I'll split an extra-thick strand in half to make splicing smoother. I can see why this stuff is popular; it splits great, and is easy on the fingers while twisting, too. ArmyMacE, schapm, happywanderer and 7 others like this. Wow, I am in. Cannot wait to see this finished. OrienM and CivilizationDropout like this. Not in, but that looks like a great start and good on you for the GAW! Bitterroot Native and OrienM like this. Excellent post as always. I'm with you so far, but I'm curious as to how you'll reduce the number of loops and then create a mouth/throat for the bag. You'll take it back from a 1:1 to a 2:1? Great post @OrienM! This is a skill I have been wanting/needing to learn. Count me in! It's certainly possible to "bump down" like you describe...you'd hitch each new loop into two foundation ones, so yeah, a 1:2 ratio. 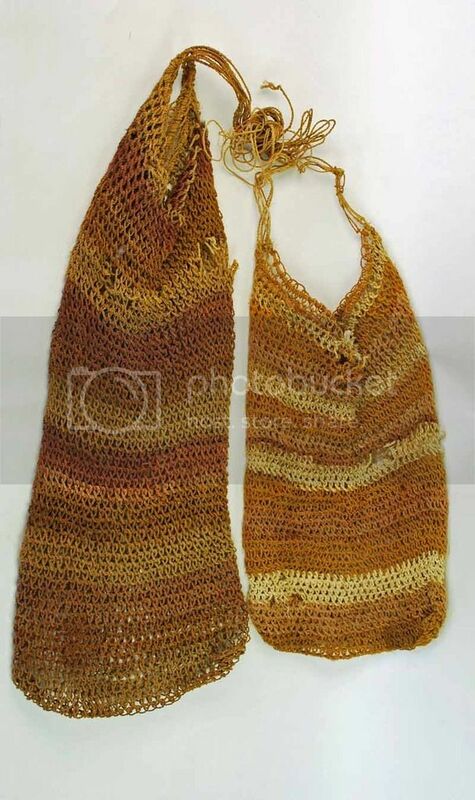 On this bag I'm probably going to make the very top row in 1:2, with big oversized loops to take a drawstring. So far most of my bags have just been cylindrical all the way to the top...this works OK too, but all those loops at the edge tend to prevent the bags from closing completely. Thanks for all the questions, comments, and "I'm in"s so far! rsnurkle, SmilinJoe, chris67 and 4 others like this. I'm in and wanting to see more. Love to see this first hand. if I win, I'll pick up the shipping as I live in the great white (right now) North. Bitterroot Native, CivilizationDropout and OrienM like this. I'm in! Thanks for doing this tutorial and GAW! You have some great cordage skills bro! All of mine has thick and thin spots but I keep working on it. I do some needle hitching, thankfuly I have a form or bottle to help keep things even. Bitterroot Native, OrienM and CivilizationDropout like this. ive been curious how to make a bag like this thanks for doing this tutorial! wa_medic, Bitterroot Native, OrienM and 2 others like this. schapm, CivilizationDropout, Bitterroot Native and 3 others like this. Great tutorial and I really like the backpack you made. Takes patience and hands without Carpal Tunnel. Is the needle plastic or bone, and where can it be bought? Thanks for showing this @OrienM . I really liked the original post you did about the making of the backpack bag. I'm in. I'm still working on some of the other tutorials you have made. I will not get to this one for a while. It would be cool to have the example in hand when I do. I may also try this with plastic bag cordage, that would be a cool survival skill. @OrienM I started a bamboo patch on my property just so I could make a pack basket using your triaxial weaving post. My wife will be happy to simply buy the raffia instead of me trying to grow something else. CivilizationDropout, rsnurkle, chris67 and 1 other person like this. This one is bone; I made it from a bit of bone scrap left from another project. They can also be purchased, and are usually listed as 'nalbinding needles'. Any big-eyed needle will work, pretty much. Plastic-bag cordage would be excellent for this! Looking forward to seeing your bamboo basket, too. CivilizationDropout, Bitterroot Native, Schwert and 1 other person like this. so, i was just pondering-how much "give" does a bag like this have? we talking more stiff like a basket or soft like cloth? and can you adjust that via different stitches, or tension or.........i'd imagine you change the stiffness somehow, but would rather ask than have to learn by try, try , trying again! CivilizationDropout, Bitterroot Native, NWPrimate and 3 others like this. I've pondered whether this is a type of basketry or a textile myself. It's fairly stiff when done in tight, small loops, but always has some flexibility and stretch to it; the larger the individual loops are made (or the finer the cord is relative to the loops), the more soft and floppy the structure gets. The different stitches do have an effect, as well, for instance double-twisted loops are more stretchable than half-hitches. I need to experiment a lot more with different loop types and ways of connecting them; there are quite a few options I've never explored. schapm, CivilizationDropout, Bitterroot Native and 4 others like this. CivilizationDropout, wa_medic, Bitterroot Native and 5 others like this. That Is A aLot of cordage !!! CivilizationDropout, Bitterroot Native, OrienM and 1 other person like this. This looks like fun... I have never made cordage as I go for any project. All my twisted leather work has been with the full length made ahead, so this splice as you go approach will be a new thing to learn. @OrienM how long is your needle? It looks about 3 inches or so. Any tips about dimensions and shape? Flat, slight curve, with long oval eye looks both functional and aesthetically pleasing. CivilizationDropout, Bitterroot Native and OrienM like this. It's just about 4" long, 3/8" wide, and 1/8" thick; the eye is 1/2" x 1/8". Exact size isn't crucial, I just based it on the size of material I had, and what felt comfortable to hold onto. Wood works great if you don't have bone, or as mentioned above, you can also use plastic (yogurt-container lids will work, etc). Thanks for the nice words, and I look forward to seeing what you weave up! CivilizationDropout, Holmesmade, wa_medic and 2 others like this. For awhile now I've been collecting photos off the net of looped artifacts from around the world, and I thought it might be useful to post a few here. Since the technique has been used by many cultures over a huge amount of time, a dizzying array of variations on basic loop weaving have developed. 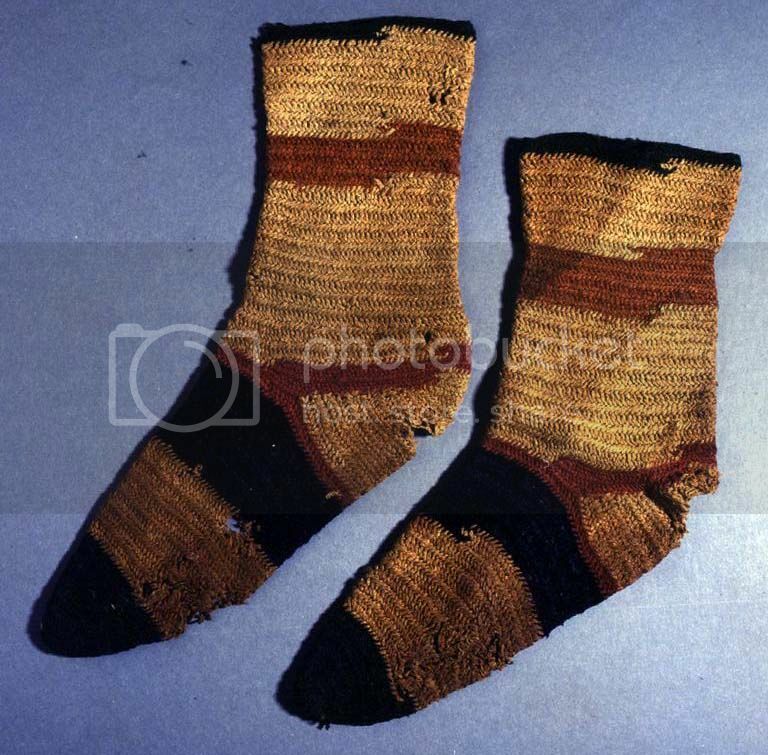 Another pair of socks, these are from Coptic Egypt. The complex loop patterns are typical of nalbinding. 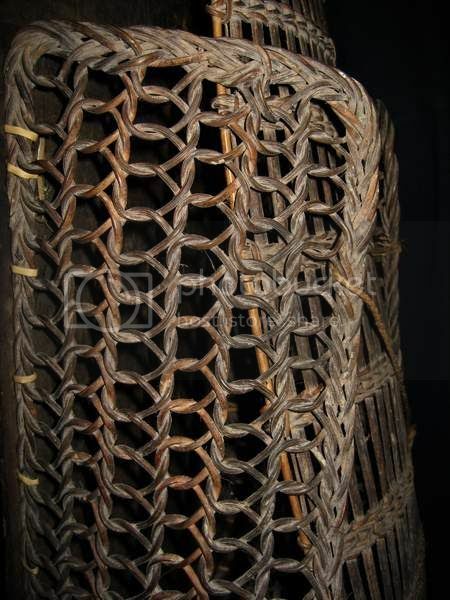 Kind of an unusual one; looped weaving done in rattan vine, on a pack basket made by the Dayaks of Borneo. The stitch is an interesting variation, two units forward, then one back. Youcantreadinthedark, Carabnr, Skruffy and 14 others like this. GREAT examples! Amazing the length of cordage that some of these would require. Can't wait till I start learning this! 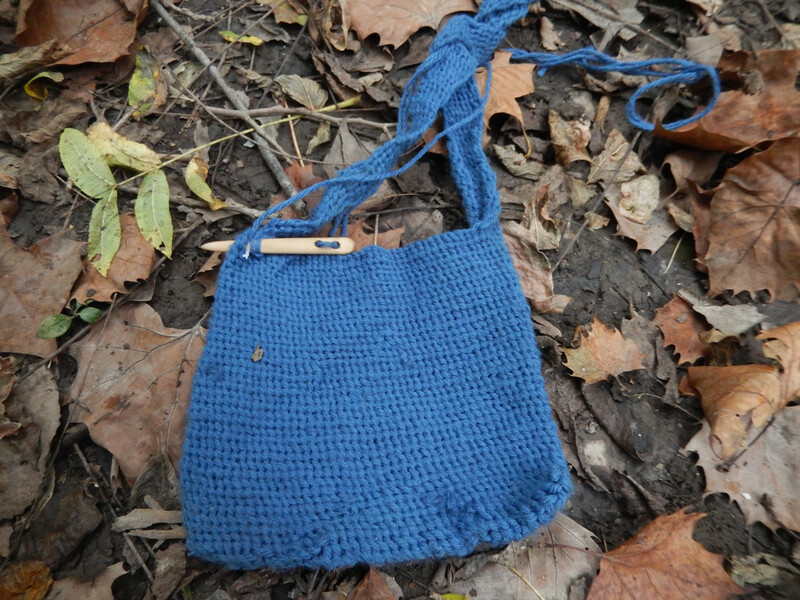 Really like the "dilly bags", once I source enough cordage I'm going to make something similar on a much smaller scale. 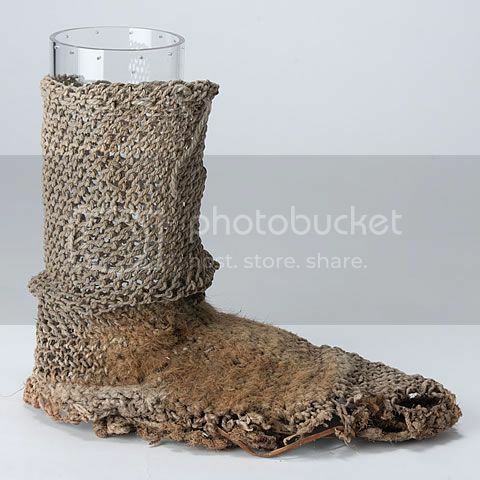 Any idea how they incorporated the feathers on that shoe sock? Feathers would probably make it much softer and also warmer depending on how they were used. Skruffy, CivilizationDropout, rsnurkle and 1 other person like this. Amazing diversity of uses. I found a pair of wool mittens on the web nalbound then felted, I want to try getting to be able to do something like this. Thanks for the needle dimensions. I may start with wood then try antler. Gii shi kan dug, Skruffy, lowtidejoe and 5 others like this. Great stuff here! Thanks for posting! Yeah, crazy amounts of cordage going on, lol. Sorry to say, you might have problems using purchased or pre-made cordage for looping...since each stitch goes through a loop, you end up spending all your time pulling through enormous lengths of cord, and keeping it un-tangled. Much easier to just make short lengths as you go along. Crochet or knitting are better suited for using pre-existing cordage in long lengths, which I suspect is why they were invented, and why they are much more commonly used these days. schapm, CivilizationDropout, Holmesmade and 4 others like this. Amazing diversity of uses. I found a pair of wool mittens on the web nalbinded then felted, I want to try getting to be able to do something like this. Oh man, those are amazing! Never seen that before; they look super warm and comfy. Nalbinding makes for thick, dense material already, and it must be even more so when felted. schapm, CivilizationDropout, rsnurkle and 1 other person like this. Gonna start studying this one. CivilizationDropout, CowboyJesus and OrienM like this. CivilizationDropout, Holmesmade, OrienM and 2 others like this. @OrienM any progress lately? I've been curious how you've been coming along. definitely going to be trying this, but living through you on this at the moment! what kind of uses do you use these bags for? @OrienM I am sorry to say that you have been hit by photobucket and your wonderful tutorial is now photoless. any chance you'll be able to repost them, pretty please? schapm and CivilizationDropout like this. schapm, NWPrimate, CivilizationDropout and 1 other person like this. glad to see those back up. and just in time-I'm giving a bilum bag a go from yucca cord I started a long while ago. I'll try for pics soon...even though I'm only one round in. and I've got to add that I'm trying this all because of your inspiration! OrienM, Quinlan, NWPrimate and 1 other person like this. OrienM, Quinlan and NWPrimate like this. i remembered i said in the old thread i'd show you my progress. trying the bilum style stitch with some yarn.....means i've had to tie knots every time i need a new thread added in, but that'll go better with the homemade cordage. i also have the tendency to make cordage projects too tight when i first do them and you can see how this got narrower in the middle (i started at the bottom and worked up) i have gotten some plastic strap i'm going to use for the next attempt to make the stitches more regular in tension. it does stretch nicely! 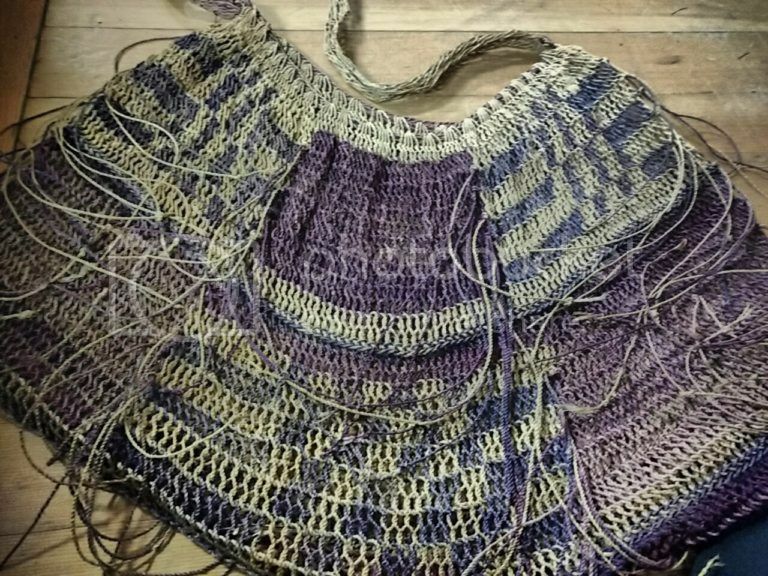 @OrienM any more progress on your bag? colter, piney, CivilizationDropout and 5 others like this. Wow! That looks great @CowboyJesus, awesome job! It's hard to see the knotted splices, and the stitches look very even...did you use a spacer or your finger to size the loops? I haven't made any more progress on mine...I twisted so much cordage this year, I apparently gave myself arthritis of the thumbs so I'm currently taking a little break from fiber work. CivilizationDropout, Quinlan, ArmyMacE and 1 other person like this. CivilizationDropout, OrienM and Quinlan like this. I'm in! I now have a new craft to give a try! CivilizationDropout, OrienM and Skruffy like this.